F YOU, F YOU, F YOU!.....WHO NEXT? The B's continue their 5 game road trip with an afternoon tilt in Atlanta today. And is anyone else as sick of seeing Atlanta as I am? The schedule makers need to be fired. Seems like Boston plays teams in bunches, then that's it for the year. Would be nice if they could spread out some of these meetings, but I guess we don't have much choice. The good news is, the B's are getting to play a lot of the "weak sisters" of the NHL while they're recovering from some injuries. The B's, winners of 7 straight, look to keep the momentum going against a Thrashers team that is, let's say, "struggling" at the moment. Besides Kovulchuk, the Thrashers don't exactly have a lot of offensive weapons that scare you. So look for Chara to be on the ice whenever the Russian star is. The thing that could make this game interesting is the bad blood that has been evident in their last two meetings. With 5 total fights between the two clubs in those 2 games, I would expect to see at least one or two bouts today. 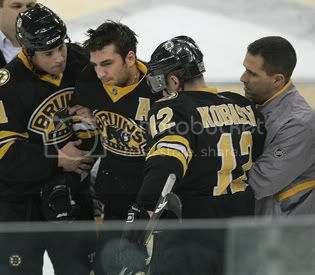 Not sure Boris Valabik looks to avenge his beat down by Chara though. I do expect a guy like Eric Boulton to stir it up a but, possibly going after Lucic again, if not Thornton. 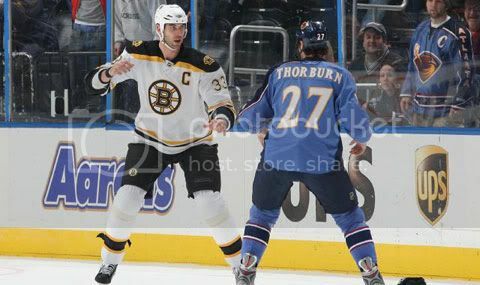 Chris Thorburn, who apparently lost his mind momentarily and challenged big Z to a bout, is another candidate to go after Lucic and/or Thornton. Sadly, these potential bouts are about I can mention that adds much intrigue to this game. I know, "any given day" and all that. Sure. Atlanta absolutely could beat the Bruins today. Stranger things have happened. But honestly, does anyone expect that to happen? Didn't think so. I see this one being over after a period. It could turn into a laugher after two. I'm going to predict a B's win, with the final score being 6-1. And that's being kind. For some reason, I almost expect more scoring than that for the good guys. If the B's jump out to a big lead early, look for things to spiral into an ugly, fight filled contest. I'll say this for Atlanta and their 'tough guys'; they have some pride and at the very least don't appreciate being pushed around. That's all I've got for now.....kind of a hard game to get all fired up over. Another game in which the B's didn't exactly bring their A game, but found a way to win. That is what quality depth does for you. The Savard line, despite Savvy picking up a pair of helpers, had a rough night. Not terrible, just not a factor for most of the game. The two other guys that really stood out for not having great night, in my opinion, were Axe and Yelle. Axe especially was shaky at best. Two minor penalties for lazy stick violations. Too many bad passes to count. For the life of me, I will never understand why PJ remains on the top PP unit. With all the skill they have on that roster, throwing out a 'defensive specialist' on your top PP makes no sense to me. Yelle, while not making as many glaring mistakes as Axe, just seemed "off" for most of the night. But in his defense, he's been thrust into second line minutes because of Bergeron's injury. He's much more effective with fewer minutes. To a lesser extent, I thought Mark Stuart had a shaky night too. It's becoming more obvious (to me) that when Ward and Ference are both back in the line-up, it should be Stuart and Lashoff that sits. Hunwick is clearly entrenched as an every day player. And Hnidy is a much more steady presence back there than Stuart. I still think Stu will be fine, but he's being out played by every other member of the D at this point. On the plus side of last night's game (they did WIN after all), Wheeler continues to pile up the points. Kid is just in a nice groove right now. Tends to over handle the puck at times, but after pulling off some of the moves he has recently, it's understandable. And Ryder? Boy oh boy, THIS is the Michael Ryder we were hoping for. He's on an absolute tear now. His release is scary good and he's doing a great job finding open ice. 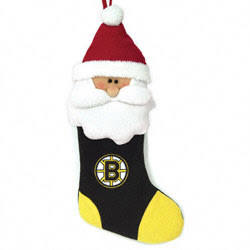 After receiving nothing but warm Christmas wishes from their opponents of late, the B's will finally face off against a top level team tonight in NJ. I guess the rumors of the Devils demise after Brodeur got hurt were greatly exaggerated.huh? Former Boston College netminder Scott Clemenson has been playing out of his mind for the Devils. Overall, the Dev's are 12-2-1 in their last 15 games. Pretty impressive run to be sure. Clemenson is getting a lot of help up front, especially from Patrick Elias, who comes into tonight with a 10 game point streak. Zack Parise is NJ's leading scorer, with 18G 22A 40PTS on the season. The Blue Line is patrolled by local boy Mike Mottau, of Quincy. Have to feel good for a guy like "Motts" (to his friends). Made the team last year as a 29 Year Old rookie and looks like he should have been there much sooner. Sometimes it just takes the right bit of luck to get your foot in the door.....just ask Tim Thomas. The Devils also get the hard working pest John Madden back from IR tonight, making them an even tougher team to play against. The plan for Boston has to be simple. Play their game. Not necessarily the game they've been playing the last few games. But that tough, physical, defense-first style that got them rolling in the first place. I don't see the B's getting away with all the defensive lapses tonight. NJ won't require a "perfect" game to beat, but a sloppy one will cost the Bruins. ROUGH STUFF PREVIEW: Let's just say I'm curious to see if David Clarkson wants another shot at Lucic. 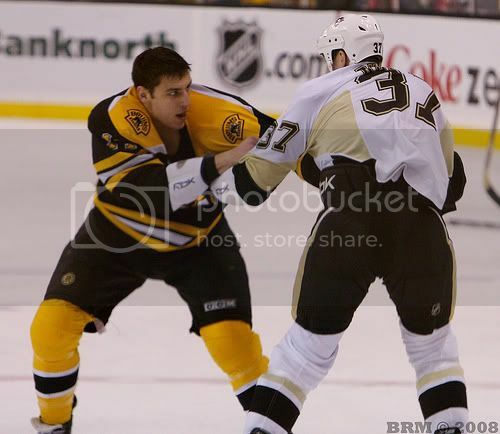 Last year, Looch put a pretty good beating on him in a one sided bout. I wouldn't be surprised to see Mike Rupp step up and challenge Lucic tonight. Rupp, at is 6'5" 230lbs, is a bigger man than Clarkson, and may fare better. That one could be an interesting bout, but I can also see Thornton heading that one off at the pass and challenging Rupp before he gets a shot at Looch. The Lucky "13 Days of Christmas"- Black & Gold Style! A bit of fun below but a sincere note wishing all of our KBBK readers a very Merry Christmas, Feliz Navidad & Joyeux Noel! Also be sure to be good to Santa & she'll be GOOD to you (If not get a new Santa I say!) Let’s Go Broounze!! – KingKrej! On the 1st Day of Christmas that Jackass Bettman Gave to ME! On the 2nd Day of Christmas that Jackass Bettman Gave to ME! *2 for Hooking!... & The STUPID Instigator Penalty…! On the 3rd Day of Christmas that Jackass Bettman Gave to ME! *3 more past Price!…. 2 for Hooking!...& The STUPID Instigator Penalty…! On the 4th Day of Christmas that Jackass Bettman Gave to ME! *4 blind refs!...3 more past Price!...2 for Hooking!...& The STUPID Instigator Penalty…! On the 5th Day of Christmas that Jackass Bettman Gave to ME! 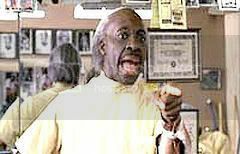 *5...for...Fighting!..4 blind refs!...3 more past Price!...2 for Hooking!...& The STUPID Instigator Penalty…! On the 6th Day of Christmas that Jackass Bettman Gave to ME! 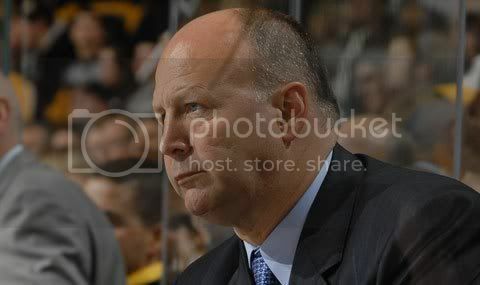 *6 New Baby B’s!...5...for...Fighting!...4 blind refs!...3 more past Price!...2 for Hooking!...& The STUPID Instigator Penalty…! On the 7th of Christmas that Jackass Bettman Gave to ME! *7 Habs a Diving!...6 New Baby B’s!...5...for...Fighting!...4 Blind Refs!... 3 more past Price!... 2 for hooking!... & The STUPID Instigator Penalty…! On the 8th of Christmas that Jackass Bettman Gave to ME! *8 Weak Franchises… 7 Habs a Diving!...6 New Baby B’s!...5...for...Fighting!...4 Blind Refs!... 3 more past Price!... 2 for Hooking!...& The STUPID Instigator Penalty…! On the 9th of Christmas that Jackass Bettman Gave to ME! *9 Ice Girls Dancing!...8 Weak Franchises!…7 Habs a Diving!...6 New Baby B's!...5...for...Fighting!...4 Blind Refs!...3 more past Price!...2 for Hooking!...& The STUPID Instigator Penalty…! On the 10th of Christmas that Jackass Bettman Gave to ME! *10 Points on Montreal!...9 Ice Girls Dancing!...8 Weak Franchises!…7 Habs a Diving!...6 New Baby B’s!...5...for...Fighting!...4 Blind Refs!...3 more past Price!...2 for hooking!...& The STUPID Instigator Penalty…! On the 11th of Christmas that Jackass Bettman Gave to ME! *11 Bru’s at Sully’s (Oh Boy)!...10 Points on Montreal! ...9 Ice Girls Dancing!...8 Weak Franchises!…7 Habs a Diving!...6 New Baby B’s!...5...for...Fighting!...4 Blind Refs!...3 more past Price!...2 for Hooking!...& The STUPID Instigator Penalty…! *12 Forwards Just Like the B's!...11 Bru’s at Sully’s!...10 Points on Montreal!...9 Ice Girls Dancing!...8 Weak Franchises!…7 Habs a Diving!...6 New Baby B’s!...5...for... Fighting!...4 Blind Refs!...3 more past Price!...2 for Hooking!...& The STUPID Instigator Penalty…! And finally...On the LUCKY 13th Day of Christmas that Jackass Bettman Gave to ME! *That Friggin’ Stanley Cup we’ve been waiting on for the B’s!.. In other news- The Bruins have recalled Martin St. Pierre from Providence and placed Marco Sturm on the Long Term Injured reserve list. I believe that move was made prior to the Bergeron injury, so we may see another call-up to ensure the Bs have an extra body in St. Louis and the rest of the trip. The injury bug is starting to make it's presence knownin Boston. Let's hope the boys can hold the fort until they start to get some healthy bodies back......which hopefully will be very soon. While I don't think coach Julien will be too thrilled with the overall team D last night, he has to love having the luxury of such a good offense. Sure, once it to 5-1, you me and everyone else thought it was going to be a blow-out. Problem is, nobody told the Leafs. To their credit, they kept coming at the B's and made a game of it. Getting it to 6-5 before the end of the second period was huge for them. But here's where this Bruins team is different than the ones we've seen for the last few years. They simply went out and scored two more to seal the deal. And thanks in no small part to Manny Fernandez, they kept Toronto off the board in the third. Amazing that they can seemingly turn it on and off at will. As much as I hate seeing them blow big leads, it doesn't seem like it bothers them too much. But, it has to be said that this trend lately of jumping out to big leads, then having to scramble to come away with a win could be worrisome. Is it just a fluke? Or is it a sign that things are starting to slip a bit? The bottom line is they are winning, but against much "easier" competition this month, they've seemed to be challenged more than they should be. Things just don't look as "sharp" as they did in November. Then again, they played nearly perfectly for a solid month. So that's a pretty tough act to follow I guess. In my last post I raved about Phil Kessel and how he's matured as a player this year. Well, I'd be remiss if I didn't do the same for Krejci. 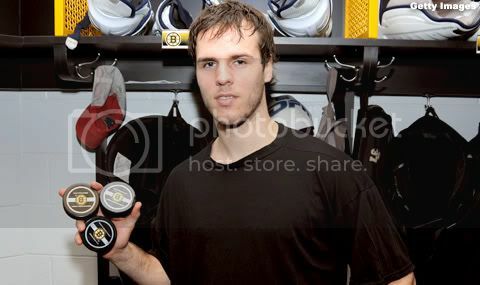 Remember the David Krejci we saw early last season? The guy that seemed to get a million chances, but just couldn't score to save his life? I think he's over that now. Classic example of a guy benefiting from being sent back to the minors to work on his game. We all know how good he looked in the playoffs, but he's taken it to another level now. All three of his goals last night were things of beauty, for different reasons. Obviously his second goal will (rightfully) be the one on the highlight reels. Incredible skill and patience on that one. Even he was at a loss to explain what he did. But the one that really sticks out to me, was the one that started the hat tossing fiesta. Savard made an incredible pass across the crease to an awaiting Krejci. Looked like an easy little slam dunk, right? Well, as Andy Brickley mentioned, that's a harder goal to score than some may think. Savvy FIRED a hard pass, so no simple tap in was going to work. 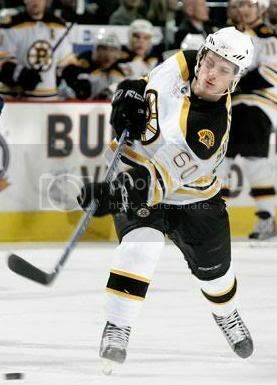 As Brick pointed out, watch how Krejci bends over the stick to get max leverage on it. If he was softer on his stick, there is a good chance the puck would have deflected away. This is exhibit A of what I mean when I rant about players (Wheeler!) not "bearing down". If krejci had just assumed he had the goal based on his position, he would have ended the night with a nice 2 goal effort. But because he knows how to BURY shots, he skated off with a couple hundred hats (no bras) to add to his collection. It's these seemingly "little" things he does so well. His ability to slow things down when the situation calls for it is incredible. For a young guy, he has an incredible amount of poise. He can't compete with Kessel in terms of speed and shooting ability. But he's every bit Kess's equal in the thinking part of the game. He also has the same "natural scorer" gene. And frankly, throwing a guy like Krejci over the boards has to cause defenders migraines. 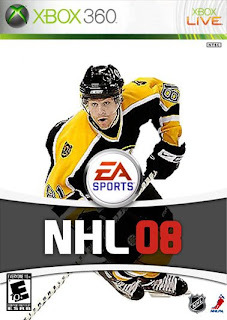 One shift they're trying to speed everything up to keep up with Kessel and Savard. 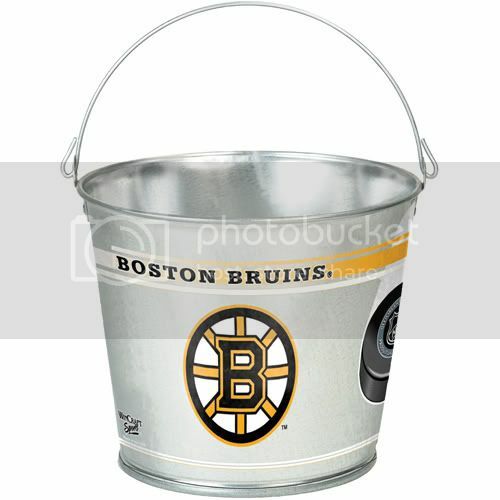 Next, they have to slow everything down to try and contain Krejci. Good luck with that. And finally, a plea. Can everyone PLEASE stop all the inane trade rumor/speculation? Dear Lord, I'll never understand why so many people feel the need to drum up some far fetched, short sighted trade scenario. Invariably, these Internet rumors end up being laughable when you look at the specifics. Everyone seems to think that team A will give team B anything team B needs for a bag of pucks. And the salary cap apparently doesn't exist in this fantasy world of non-stop "roster upgrades". For those of you not paying attention, the Bruins are in first place in the Eastern Conference. They've scored more goals than anyone in the league. They've allowed fewer goals than anyone else. What, exactly, is a glaring "need" for them right now? I've seen so many people talking about trading Manny Fernandez "while his value is high". Huh? First, everyone wanted him out of here because he was a "bust" or whatever. Now he's proving to be the goalie we all wanted him to be when he got here, and suddenly THAT is why he should be dealt? Last I checked, all the experts and everyone else will tell you that "Goaltending wins playoff series". Well, call me crazy, but doesn't having TWO top shelf goalies increase your chances of finding that "hot hand" during the playoffs? When was the last time the B's could realistically dream of making a long playoff run? Why would they make a move that could potentially take a position of strength and make it a weakness? What happens say, if they did trade Manny for a defenseman....and Thomas gets hurt in April? You're now entrusting this team, the team that had everything in place to be a threat, to Tukka Rask? Nothing against Rask, but that's an unfair spot to put him in. Obviously, as it gets closer to the trade deadline, Chilly will be listening to all offers. Any good GM would. That's called due diligence. But it would have to be a mind blowing deal, in my opinion, for Chilly to make any "significant" move. Chemistry, as I've said 100 times here, is a huge part of an NHL roster. And these guys have it in spades. All the pieces fit and work perfectly together. I see no reason...especially now, in December, to even engage in the "what if we trade X..." discussion. It's pointless. It's mind numbingly tedious. And all it does is serve to distract us from the good times we should be having watching these guys play. It's been a long bumpy road around here the last few years. Time to start enjoying the ride and embracing the possibilities. Does that set me up for failure? Possibly, but I'll deal with that disappointment if and when it comes. I refuse to let the fear of "what if" derail my enjoyment of watching the most fun team in the NHL. With a recession, layoffs and every other piece of bad news that gets thrown at us every day, I'm going to let hockey ENTERTAIN me, just like it's supposed to. I have enough stress without creating my own dooms day scenarios over my hockey team. B's NewsBlast - Kess Named NHL's First Star ! Boston, MA -- The NHL announced today that Boston Bruins forward Phil Kessel was named NHL’s First Star of the Week for the week ending December 14.Kessel tallied eight points with three goals and five assists in four games last week and extended his point streak to 15 games. 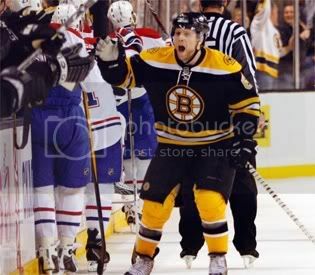 Kessel helped lead the Black and Gold to a 3-1-0 record, which improved their Eastern Conference-leading mark to 21-5-4. Kessel notched one goal and one assist in a 5-3 victory over Tampa Bay December 8, registered an assist in a 3-1 loss at Washington Dec. 10, tallied a goal and two assists in a 7-3 win at Atlanta Dec. 12 and closed the week with a goal and an assist in a 4-2 win over the Thrashers Dec. 13.Kessel's point streak is a career high, the longest in the NHL this season and longest by a Bruins player since Adam Oates recorded points in 20 consecutive games from Jan. 7 to Feb. 20, 1997. The 21-year-old Madison, Wisconsin native is second in Bruins scoring with 31 points (19 goals, 12 assists) in 30 games, ranks third in the NHL in goals and already has matched his career high of 19 goals set last season.The NHL will conduct a media conference call with Kessel today at 3:00 p.m. ET.Pittsburgh’s Petr Sykora received the Second Star honors as he recorded three goals and five assists in four games last week, while Buffalo’s Thomas Vanek claimed the Third Star after registering a week-high five goals, including two gamewinners.The Bruins return to action on Thursday, December 18 when they host the Toronto Maple Leafs at 7:00 p.m. ET. Side note- A quick tip of the cap to Kevin Paul Dupont of the Boston Globe. I bumped into him before the game and said hi. To his credit, instead of blowing me off, or offering a half hearted wave, he turned and came back to say hi. Stuck out his hand and asked my name etc. Just a classy move in my opinion. More proof that "hockey guys", be they players or media, are generally the biggest gentlemen in sports. NHL News: NHL Suspends Avery for talking about "Sloppy Seconds"